This week’s topic will be covered in six pages because many images are needed. [Forgive us for the low quality images – They do get the point across though]. The images in our website should be viewed from up to down and the images should be viewed from left to right in our pdf. In this article it is best to begin with some case studies of magicians and jinns doing their falsehoods before exposing them via the Quran and Sunnah. The magician Dynamo will be used for our case studies. One of the most common tricks produced by Dynamo is simply to read the people’s mind like an open book. Reading the people’s mind like in an open book is simply not human, there is no trick in this, it’s pure jinns’ work. The debunkers say that Dynamo sends compliances secretly interviewing these people, and then feign to read their mind. Which is ridiculous as Dynamo asks them very random questions, he does not ask the best song, but any random lyrics for instance. Let us examine the following case studies to see how the jinns read people’s mind in live. They can even perceive when the people change their minds in live!!! Dynamo: Just think of a place right now. It might be somewhere you’ve been. Might be somewhere you want to go to. Just….You got a place in mind? Woman who is with a man replies: Yes. Dynamo: Ok [Dynamo then looks the woman in the eyes and pretends to think for quite a while and says while scratching his chin:] You just changed your mind. It begins with “C” ,right? Dynamo: It’s, um…[He continues pretending as if he is concentrating while still looking her in her eyes and says:] See, for a second, I thought you thought of Cancun. Dynamo: But you changed your mind, didn’t you? [In which the woman nods to affirm this] [Dynamo continues to concentrate on the woman and pretends he has already read her mind and says:] Cincinnati. Woman: That is crazy. That is actually crazy. Bloody hell. That’s nuts. The man that was with the woman asks: How did you do that? Woman: It’s his eyes, that’s what it is. Dynamo: So you have worked with a lots of artists, right? 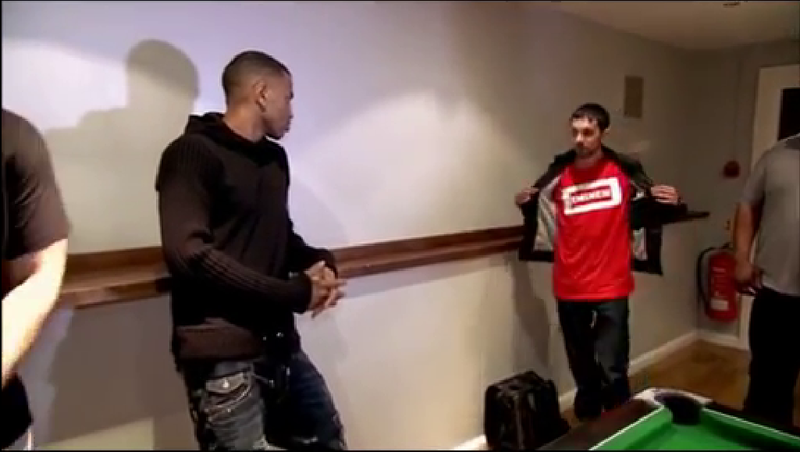 Dynamo then moves back and tells all of the people in the pool table area, “Watch this.” He goes into a corner and suddenly he is instantly out of nowhere now wearing a red shirt inside written Eminem. The guy is shocked and amazed he got it right since he thinks Dynamo is the one reading his mind and gives him a quick hug. From the previous article you now realize that the jinn just brought the t-shirt to dynamo with the name already written since the name EMINEM and the box around it is one of the many images the jinns can manipulate. 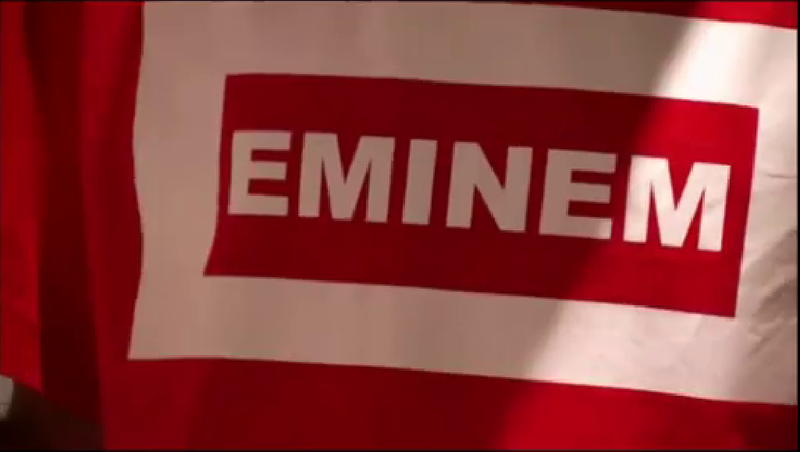 The jinn knew who Trey thought of then imprinted ‘EMINEM’ using materials on the t-shirt. The shirt was then teleported to Dynamo. Keep in mind Dynamo didn’t remove any cloth or wear any cloth, it was just suddenly on him. We first look at how it is possible for men and jinn to communicate with each other. The direct communication between mankind and jinns does take place in three ways, and Allah knows best. The first way is when man and jinn communicate with each other in their respective realms. Man is in his realm and the jinn is in his realm. The man and the jinn can communicate with each other without other people knowing especially if they have made a contract meaning the man is a magician. Note: The jinns can even in very rare cases try to communicate with people they have not made contracts with. They might seek you out to make a contract with them. They might send out their sound from their realm and we humans can hear it without seeing the jinn(s). This is just how like we can see objects move around without seeing the jinn moving them. An example can be of a person who enters a house inhabited by jinns and they try to scare him away by their voices and moving objects around. The second way is that the jinn can come into our realm and take up the form of a person or animal and speak with us (men). The third way is that the jinn can possess someone and speak with people through the possessed person. Believe it or not mankind can even give evil ideas that even evil jinns or Satans could never have come up with. Apart from the stories which have no evidence like that of a king who thought of such an evil idea that his Satan told him, “Fear Allah”; we have one which actually occurred in the lifetime of Prophet Muhammad (SAW). Remember when Abu-Jahl gave out the best suggestion on how to best kill Prophet Muhammad (SAW) and was congratulated even by Iblis (Satan) himself who had taken the guise of an old man and was present at that meeting. This is how all magicians and their jinn partners work. They plan ahead of time, and if changes have to occur while they are fooling people then the magician and his jinn(s) communicate with each other without other people knowing. They don’t know because they can’t hear the jinn and the magician is communicating via thoughts. When a magican wants someone to cause a person discomfort to hear sounds only he can hear; he sends a jinn to possess the person so that the jinn can torture him with voices only he can hear in his head. Let us read the following two articles from our fellow Muslim brother below before we present some proofs via the Quran and Sunnah. As salamu alaykum, just to clarify for other viewer of this website that jinns can be categorized as internal jinns or external jinn i.e. they can be inside the body or outside of the body. The jinn inside the body can hear your thoughts when you “talk to it in your mind”. So if you ask the jinn a question via thoughts it may or may not respond back via a thought. This is well known and has been mentioned by many patients. This is because they share the same body and mind as yourself. Additionally it may be useful to know that an internal jinn cannot communicate with another jinn that is inside the body of somebody else. (Only the ones that are in the same body as itself). So if brother A is possessed with two jinns and sister B is only possessed with one jinn. The two jinns inside brother A can talk to each other but can’t talk to the one inside sister B. In order for the jinns in brother A to communicate with the jinn in sister B there has to be an external jinn to carry the message across. There is a case where the husband is doing ruqya on his wife and she hears a voice in her head shouting out “Go wake up their son! Then the ruqya will stop”. A few seconds later a crying sound could be heard from upstairs, forcing the husband to stop and go to his son. Upon investigation the husband finds his son sitting up, crying and scared as though he woke up from a nightmare. Explanation: An external jinn woke the boy up to stop the ruqya. Extra IARLG note: From Sahih al-Bukhari 7017 [see below] we know that jinns have the abilities to make people have nightmares. This is what must have happened. A brother came to me for ruqya and said he used to hear two female voices talking when he was able to fall asleep. We later found two female jinns inside him. Explanation: This shows that two jinns in one person can communicate with each other. Thus the jinn was left humiliated. Explanation: If the internal jinn inside this brother couldn’t communicate with the internal jinn in his sister or it would have told her the answer. Rather to communicate there needs to be a third external jinn. Wa alaykum as salam . Jazak Allah khair for your question. Sometimes things don’t appear to ‘work’ because the right treatment is being applied to the wrong situation. It’s like a person who complains that they do exercise but don’t seem to lose any weight. Upon further investigation it is discovered that they are doing high intensity exercises such as sprinting, skipping and boxing for a short period time. Such exercises are very good if a person is intending to increase their stamina and improve the general health of the cardiovascular system. But for fat burning, the exercises have to be at a slow pace and for longer periods of time, which causes the person to sweat more. Similarly ruqya oil is used to prevent or stop a jinn from entering into the specific part of the body where the oil is applied. Or it can be used to stop the pain caused by an internal jinn (one that is inside the body). But once the jinn has entered, applying ruqya oil won’t expel the jinn from the body. The azan is good for causing the jinn to flee from the room but if the doors haven’t been closed while saying “Bismillah” or the house is unprotected then the jinn can come back into the room. If someone has done magic on you, it is very likely that you are also possessed by a jinn. These two things are often done hand in hand. Further more If there is a jinn inside you (which is present due to the magic that has been done on you) then most likely there will also be external jinns guarding the one inside so that it does not leave. They may not possess other family members because that will be contrary to their task that they have been sent with. The task of these external jinn is to kill the jinn that is inside your body if it tries to leave. If the house is unprotected then these jinns can come inside and increase problems between family members. It’s one thing dealing with the magic that affects your hormones and emotions but last thing you need is something else making your life a misery. Internal jinns cannot communicate with another jinn that is inside the body of somebody else. (Only the ones that are in the same body as itself). So if brother A is possessed with two jinns and sister B is only possessed with one jinn. The two jinns in brother A can talk to each other but can’t talk to the one inside sister B. The other disadvantage of having an external jinn around the house is that it will prevent or try to sabotage any type of ruqya to help the victim. I have personally experienced a case where as I was doing ruqya for a sister, the jinn with her was making a continuous tapping sound in the kitchen even though there was no one else in the house other than herself and her husband. I went to investigate and found the sound stopped and there was nothing that could have caused the sound. I have also heard of cases where the husband is doing ruqya on his wife and she hears a voice in her head shouting out “Go wake up their son! Then the ruqya will stop”. A few seconds later a crying sound could be heard from upstairs, forcing the husband to stop and go to his son. Upon investigation the husband finds his son sitting up, crying and scared as though he woke up from a nightmare. I strongly advise you to read the whole of Surah Baqarah in your house once every three days. Especially if you are doing ruqya for yourself or other members of the family. If done properly this will force the external jinns to stay outside the house. There will be peace and tranquility in the house as compared to when it is not read. Sometimes people read surah Baqarah in their house but feel that it has not worked. In reality something has been done wrong. If there are pictures humans or animals (hanging on the wall or on display), a dog, bell (Church bell types not the electronic door bell types) or anything haram (like music) in the house it prevents the angels coming into the house then Surah Baqarah will have no affect. Surah Baqarah needs to be read inside the house that you are intending to protect. Not in the garden or in the car or another place. Surah Baqarah, azan etc will only get rid of the external jinns as long as they are not prevented by magic. Sometimes magicians who disguise themselves as maulans/ imams give the people rust nails to knock into the four corners of the house or four taweez to hang up. This a method to lock the jinns in the house so they can’t leave. Finally avoid committing sins as much as possible because that removes the protection of Allah. Repent as fast as possible when a sin is done. Allah Knows Best. Peace and blessings be upon the final messenger Muhammed (صلی اللہ علیہ وسلم) his family, companions and everyone who follow him in righteousness. The communication between a magician and jinn when performing is what we will be looking at today. We will be referencing a lot of Ayats from the Quran and Hadith which can be found below. To begin with Sahih al-Bukhari 5762, we know that magicians are using external jinns. This is because the jinn is going to the heaven to steal information and brings it to his friend (fortune-teller). Even Sahih Muslim 2396 shows that external jinns sometimes avoid certain people like the way the Satans would avoid Umar. This can also be seen in the posters and books of some of the top magicians where they display themselves and the jinns are external; this can be seen in our 127th article which can be read at: http://aljumaareminder.com/reminder/127-iarlg-magicians-part-7-performance-magicians-3-out-of-x-date-29th-july-2016-23rd-or-24th-shawwal-1437/. These external jinns that work with the magician are responsible for communicating with the Qarin jinns who are internal jinns. We all have internal jinns which are Qarins. We can see in [Sahih al-Bukhari 3281] below that even Ansari men were prone to the insertion of evil thoughts by the Qarin that runs through them. The Ansari who have such a high rank are being told this by Prophet Muhammad (SAW), what about you and us? Ansar (Arabic: الأنصار‎‎ al-Anṣār, “The Helpers”) is an Islamic term for the local inhabitants of Medina who took the Islamic Prophet Muhammad and his followers (the Muhajirun) into their homes when they escaped from Mecca (hijra). There is one who is sent by a magician to possess man or the jinn possesses the man just for its own personal revenge. These were once external jinns and if they become internal jinns by possessing someone then they will find the Qarin jinn already present. The internal jinn who is always with us and gives us bad thoughts when we forget Allah is the Qarin jinn that keeps on inserting wicked thoughts in us. He can even recommend good at first with the aim to lead you to do evil as can be seen in Sahih al-Bukhari 3276 below. The Qarin tells man to contemplate on who created this and that till, “Who created Allah?”, in which Prophet Muhammad advised us to give up on such thoughts. This hadith is proof that the internal Satan can read our thoughts and through them lead us to sin. The human brain is a network of approximately one hundred billion neurons. Different experiences create different neural connections which bring about different emotions. And depending on which neurons get stimulated, certain connections become stronger and more efficient, while others may become weaker. This is what is called neuroplasticity. Rudiger Gamm, who was a self-admitted ‘hopeless student’, used to fail at basic maths and went on to train his abilities and became a famous ‘human calculator’, capable of performing extremely complex mathematics. Rationality and emotional resilience work the same way. These are neural connections that can be strengthened. Whatever you are doing at any time, you are physically modifying your brain to become better at it. The major function of the internal Qarin jinn is to give bad thoughts so that you turn away from remembering Allah to the point you are with accompanied by external jinns and to the point you make contracts with them. Since there is no contradiction in Quran and Sunnah; you might ask yourself. Why did Prophet Muhammad (SAW) say Satan takes a different route when he sees Umar and why did he say everyone has a Qarin attaché from the jinn who orders evil except for himself. This clearly shows that there external evil jinns and the internal evil Qarin jinn. The external evil jinns run away from Umar because (Qur’an 26:221-223) does not apply to him and because he does not entertain evil thoughts from his internal Qarin jinn as seen in (Qur’an 7:200-202). From (Qur’an 7:200-202), we learn that even the pious can receive evil thoughts from Satan; if they remember Allah they see alright but if they entertain the evil thoughts and therefore forget Allah, (Qur’an 26:221-223) & (Qur’an 43:36-38) occurs. We know that every human being was pricked by Satan except Maryam and ‘Iesa (Jesus) so this most likely means that Suliaman also had a Qarin (jinn). Was it also Muslim like how Prophet Muhammad’s Qarin was Muslim or was it rebellious? Did the Qarin die with Prophet Sulaiman and that is why it couldn’t inform the external jinns who were working. If the Qarin was a evil and alive it would have informed the other jinns to stop working but it seems that it could not and that is why the worm informed them. If the Qarin was a Muslim and alive, he also would have tried informing the external jinns so that proper burial would have taken place but it seems it could not and that is why the worm informed them. IARLG note: In Sahih al-Bukhari 1338 (see below), we see that human beings and jinns are the only creatures that can’t hear the punishment in the graves; hence the Qarin (jinn) if really in the graveyard and the magician are oblivious when doing their kufr (disbelief) confidently in the graveyard. IARLG note 2: Sometimes the evil thoughts we have are from Satan speaking in first person impersonating our voice in our head/mind till we believe it our own thought. We use sometimes because Allah says in (Qur’an 7:200) “If an evil whisper comes from Satan…”; this shows that sometimes evil thoughts can be from our own selves. And that is why in (Qur’an 114:1-6) we seek refuge in Allah from jinns first then mankind later. Remember how Abu Jahl gave an advice that even Satan (Iblis) was pleased with; this shows that humans can come up with evil thoughts too, and that is why people still sin in the month of Ramadan. Now it is difficult to know if the evil thought is from you or from Satan since Satan can impersonate your voice (& many other things) and speak in first person in your head/mind.